The DTI 6300/16 and DTI 6300/25 are exactly the same unit, except that the /16 has a 160GB hard disk and the /25 has a 250GB hard disk, so the fix is the same for both models. There are a couple of capacitors on the power supply board, C52 + C60 (1000uf 16v) which will probably need replacing. I am currently unable to report the symptoms of these bad caps, as my box was still working correctly... I merely opened it to check out the noisy fan and noticed the caps bulging. please contact me if you can report the symptoms of caps that have completely blown. UPDATE: Thanks to Andrew in UK I can now report the symptom of bad capacitors... The unit will work fine until its unplugged, then it will fail to start-up when its plugged back in. Beware: There are lethal voltages in the power board. Do this fix at your own risk! Read the disclaimer. 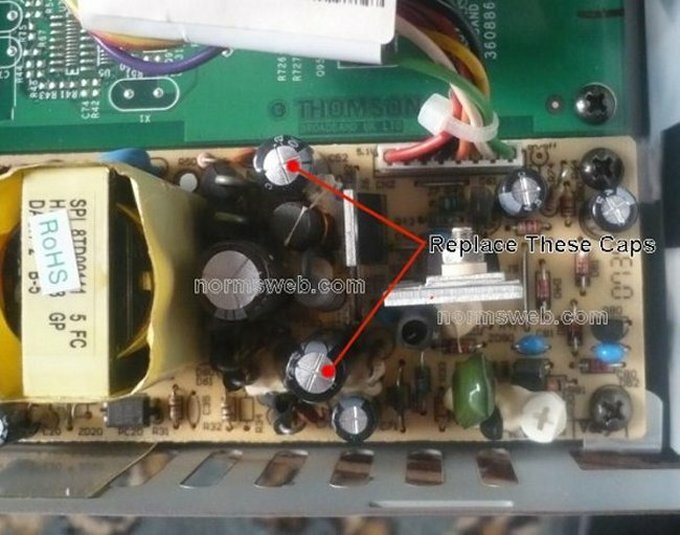 Hi, I have the Thomson DTI6300 which developed a fault where it would not power on after being unplugged. I opened the unit and after discharging the mains capacitor with an insulated resistor I could see that C60 was bulging only slightly. I removed C60 to see it was also leaking. I replaced the two 1000uF capacitors and three 47uF capacitors as a precaution and refitted to the freeview box, and hey presto it has been working fine since then, costing less than £2.00 to fix. Thanks for the pictures and descriptions on your website.